Also a more classic way of counting an extended wave 5 is shown on the SPX weekly. This is just a variation of the above Wilshire count. They both imply the same thing. Sorry for lack of posts been travelling a bit and will be for 2 weeks. There will be no morning posts but daily updates should continue. Best wave count still has new highs coming in the Wilshire and SPX. Not sure about any other index though. The best count has a wave (ii) pullback of Minute [v] of Minor 5 up. Nothing to add really after today's lackluster session. Probably the best option is to look for a wave (ii) of [v] of 5 pullback. Nothing much has changed. The call is an extended Minute [v] of 5 or a more muted [v] of 5. 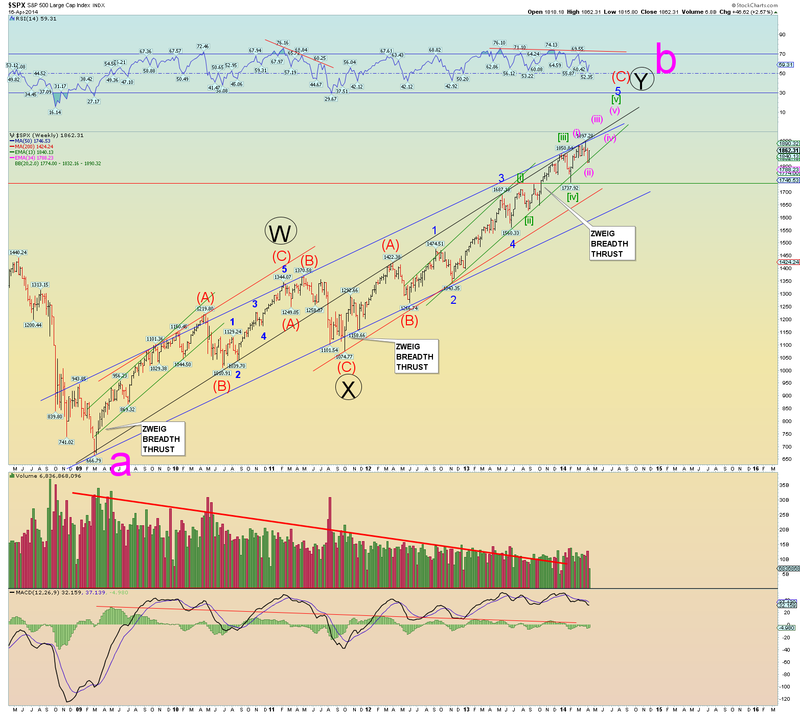 Using the SPX weekly above, if the green channel breaks down, then likely the rally is over. Or even if (ii) of [v] pivot is broken under. Nothing has changed in outlook since last week. There is a lot of different things going on. 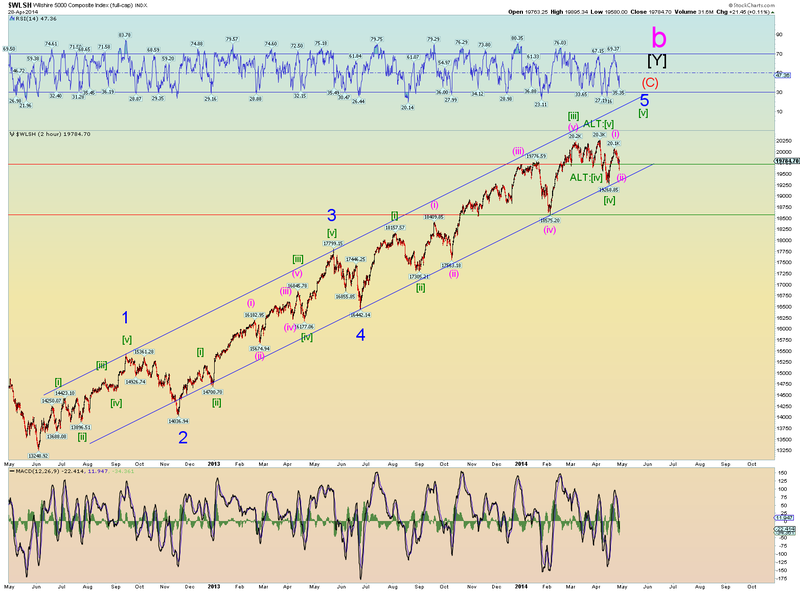 There is not yet a 5 wave impulse pattern down on any of the major indexes. 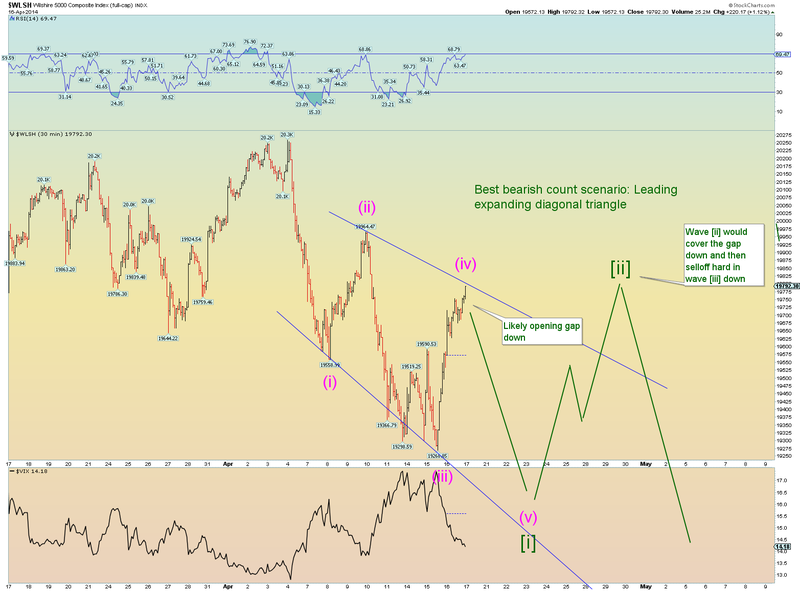 Except the banking sector is looking better as an impulse down than not. So we must use wave counting theory and assume a new high could be coming. In light of the short term wave evidence, prices point to a new, perhaps only a marginal high in likely the SPX and Wilshire5000. 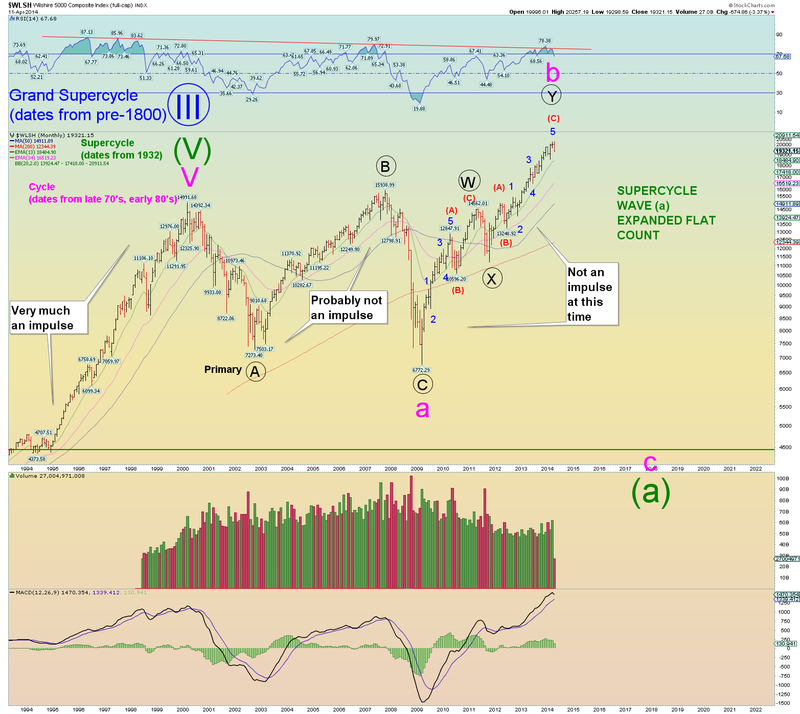 The NASDAQ and other indexes? Not so sure. Or a potential new high could count like this if it achieves a more classic "extended [v] of 5" look. 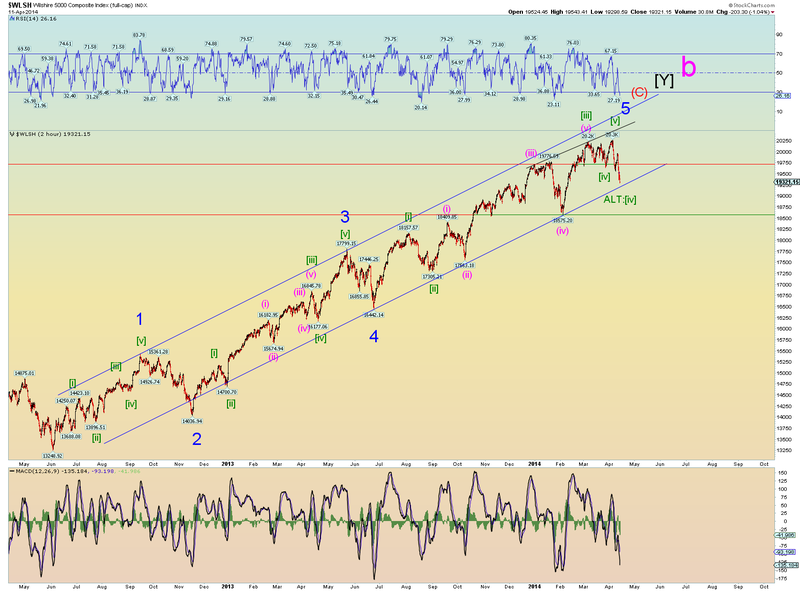 Price target: Yes, 2000 SPX. 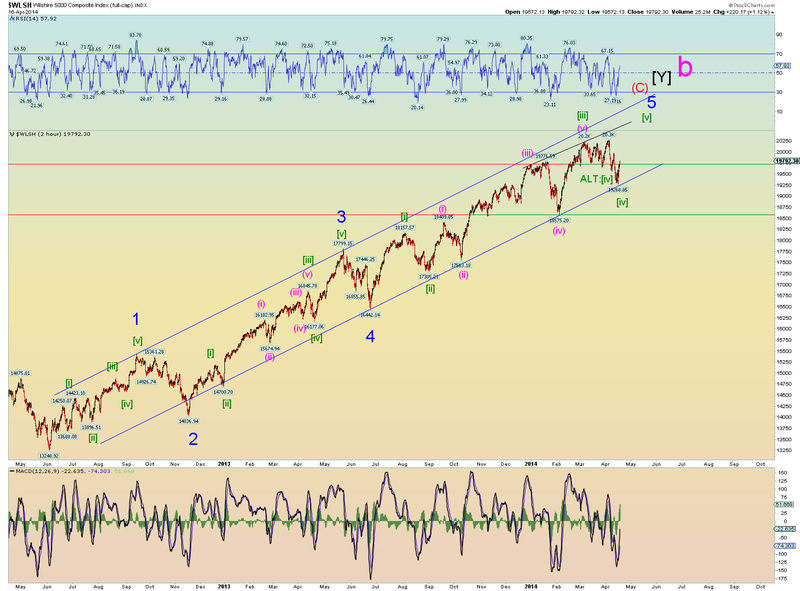 We have a more classic extended wave [v] of 5 count shown in the SPX. Either way, both charts suggest the same thing so don't get hung up in the squiggles. Target 2000 SPX if this count pans out. The count of a series of ones and twos down is not likely because the subwave two is bigger than the higher degree wave two which is less than ideal in EW theory. You can see this with simple channel line overlays. In a nutshell, the second wave two rebound is bigger than the first wave two which makes it not likely a second wave two and thus the count is suspect. 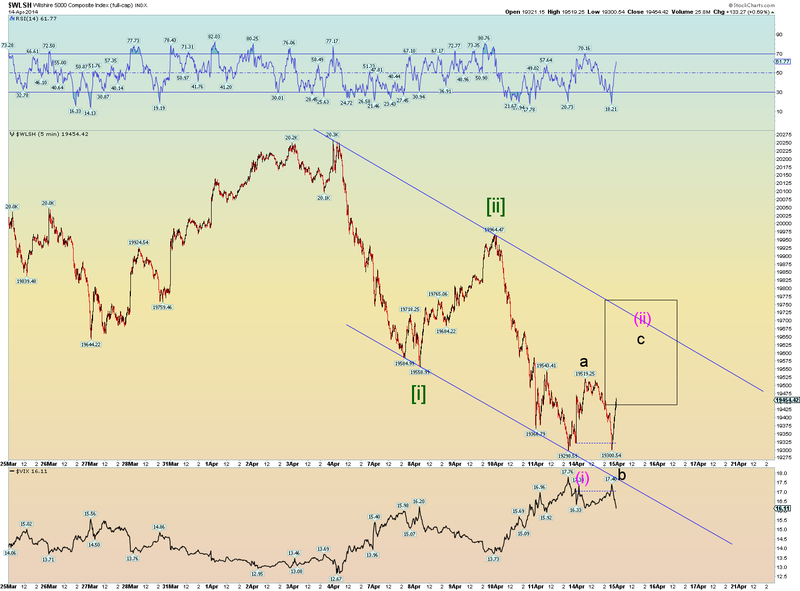 Here is the gold updated chart. I noticed MISH was pounding the table for gold and linking an article on how Goldman was saying gold is going to $1050 yet you shouldn't listen to Goldman Sachs because they frontrun the "muppets" (public). This is of course probably true that GS does frontrun the muppets but in the case of GS's $1050 target for gold there is an EW pattern that does indeed point to this $1050 price target. Is everything a contrarian play with GS's calls as Zero Hedge often suggest (and prove to be mostly right)? 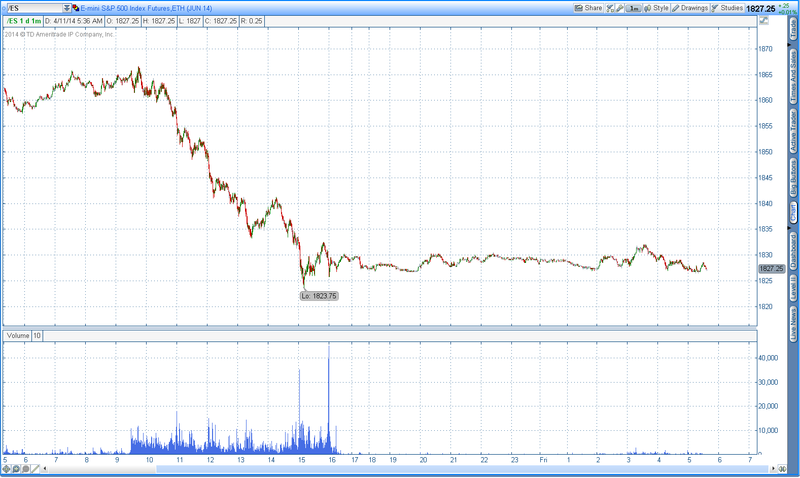 If Goldman Sachs says gold is going to $1050 should you take the opposite stance? 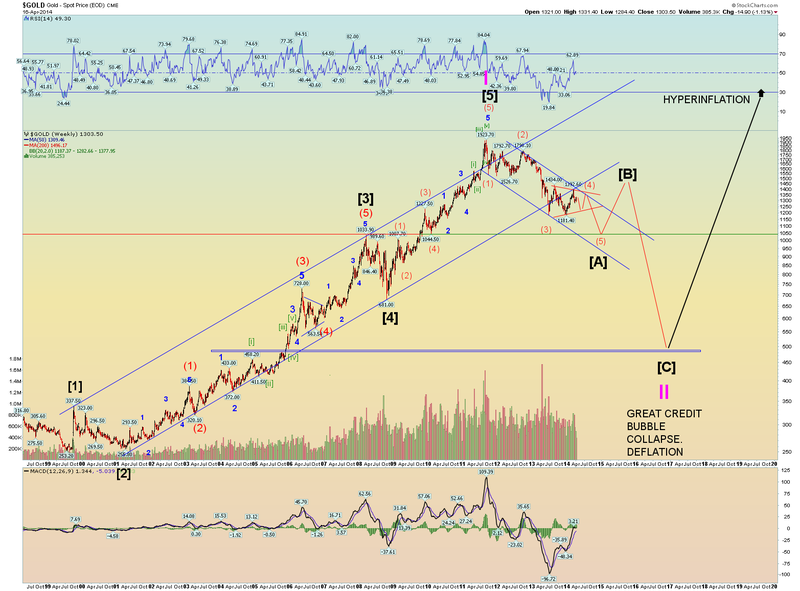 In this case the wave pattern suggests that GS may be perfectly correct in an eventual downside target of $1050 in gold. That is where support lies. A price rise above $1392 would invalidate the wave 4 triangle. Still holding the channel line. 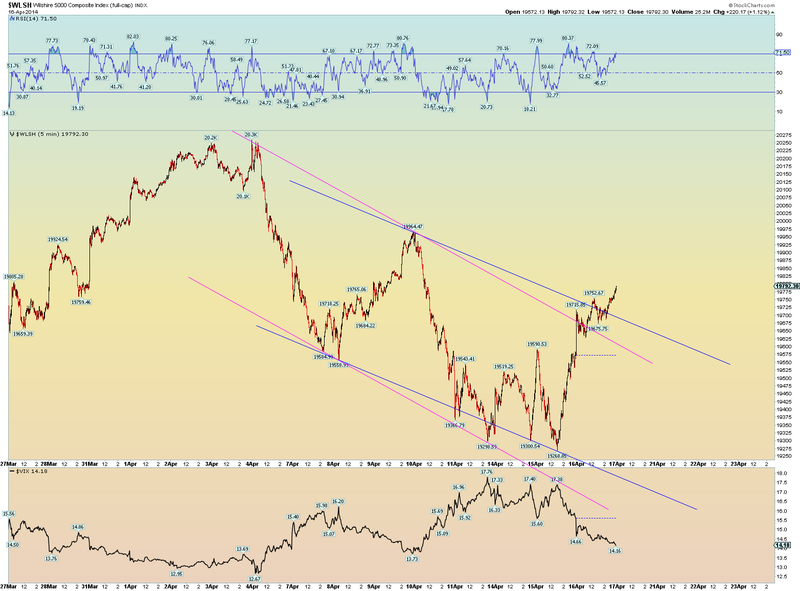 Prices have tried to rapidly advance up and away from this channel line. That means the market likely deems it important. 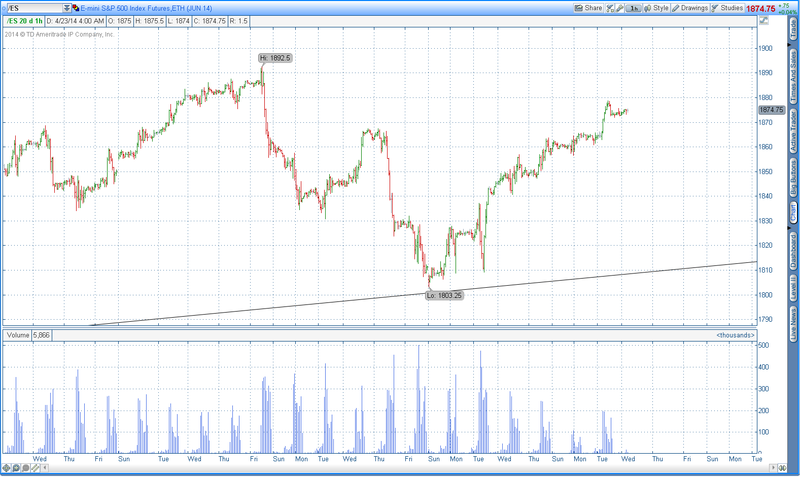 Consolidating for a further decline or establishing yet another pivot low and continuing the 2 year uptrend? 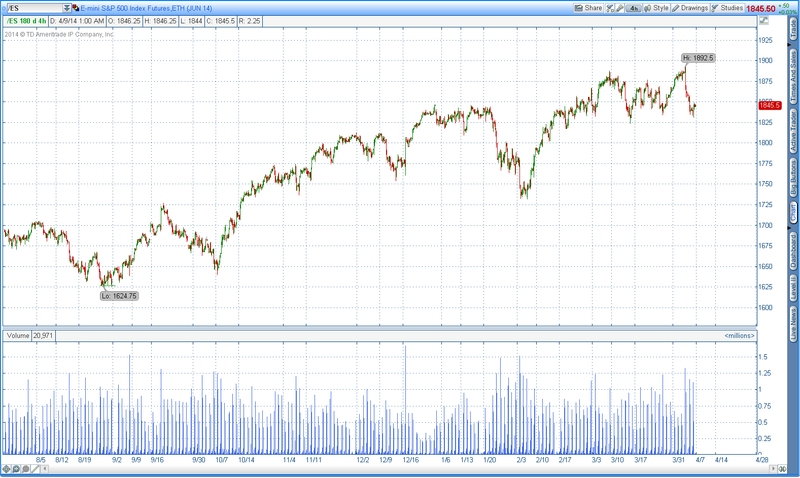 Some sub indexes look pretty sickly so the bears definitely have a case to be made. However we need 5 wave impulse patterns down on some oif the main indexes before we can count the market as going lower in an impulse pattern. 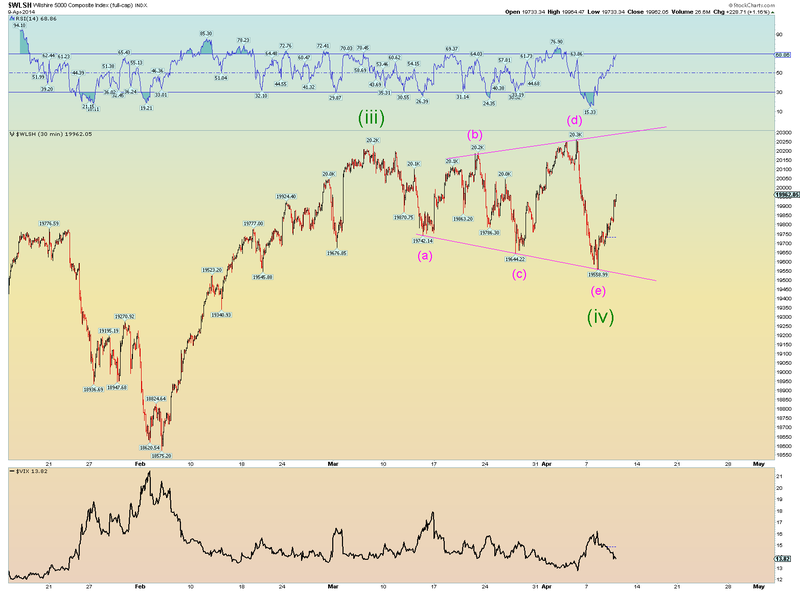 Don't see it yet on the INDU, SPX nor Wilshire5000. This weekly says it all. If the lower red channel line is broken, then we can say an EW channel has finished and a new structure is probably beginning.. Thats it in a nutshell really. 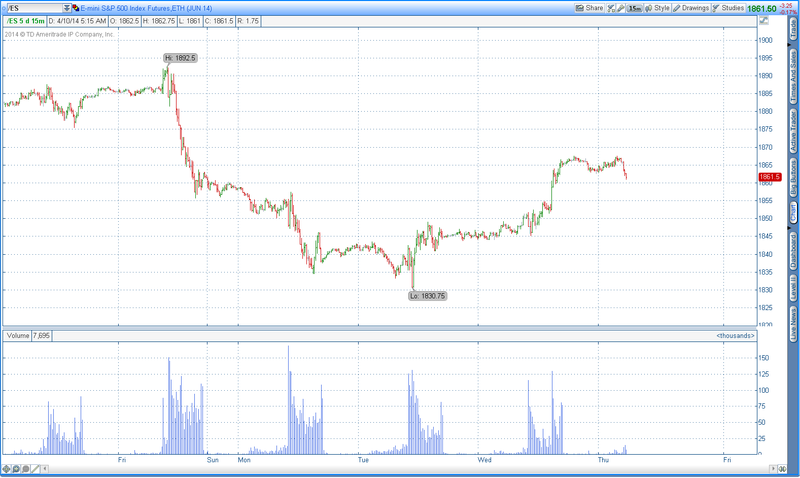 There has been some sort of Elliott Wave Structure in place since the pivot low in June of 2012. One degree or two above that there has been an EW structure since the 2009 low. 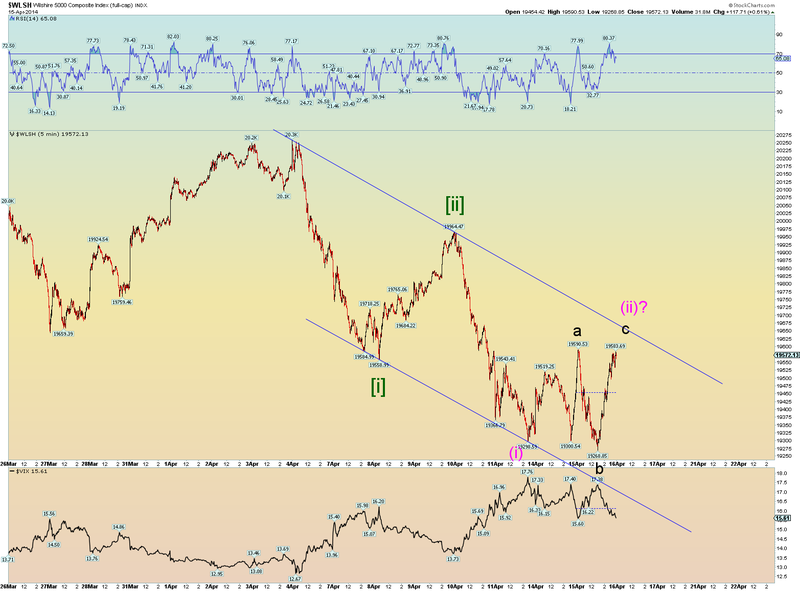 And that EW structure since the 2009 low still takes the form of a "three", which is corrective by rules of Elliott Wave theory. The overall 2 year uptrend is still intact. 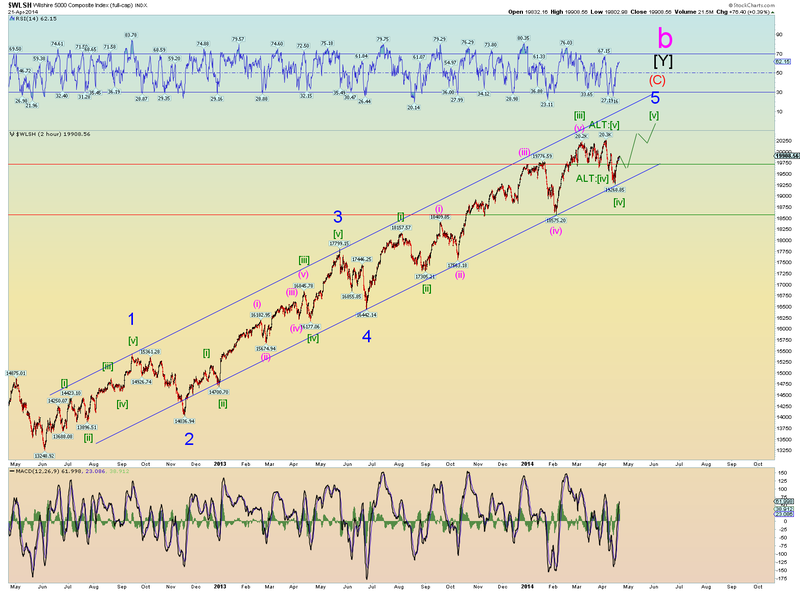 We certainly have a count if new highs are coming. 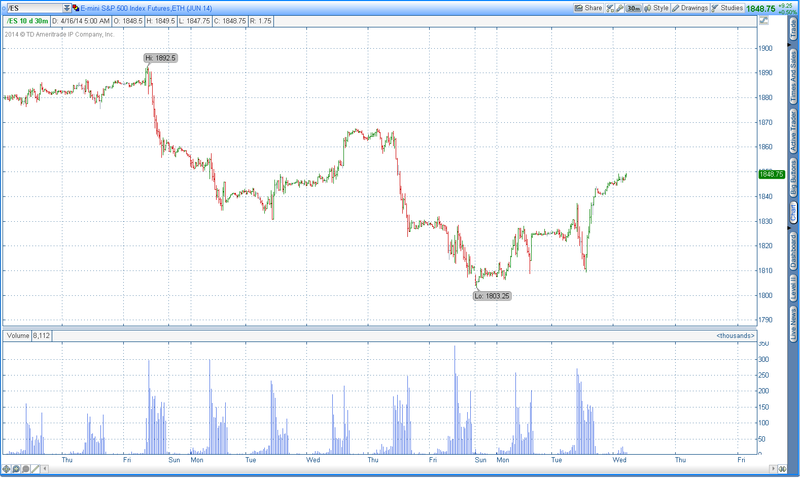 Its certainly curious that the opening gap up today was filled and then prices rose vigorously. We shall see what that portends. Sometimes I take a covered gap as the one that occurred today as a signal that market makers are covering their tracks so that further advances don't present those bear target big open gap fill price moves later on. In other words, they mean to take prices higher. 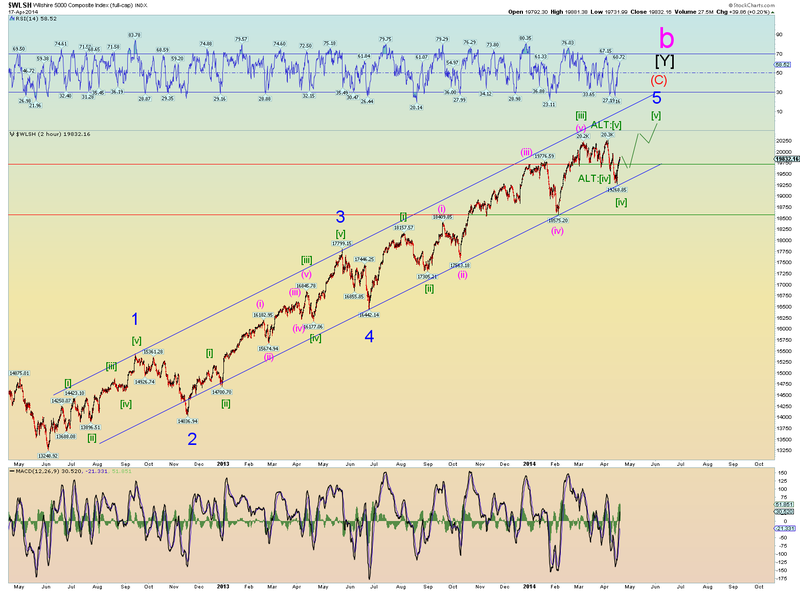 Or using the SPX weekly we still have a valid extended Minor wave 5 count as the last Zweig Breadth thrust may not yet be "expended". This ZBT event is still important in my book. I dismissed the first two too quickly and the third has managed to maintain a certain momentum also. Oh the ZBT will eventually exhaust but when is what we count waves for. Elliott Wave International's top count is a series of ones and twos down. That count has rarely worked in the past but just because it has failed too many times to mention as a viable count from the top, doesn't mean that this time might not yield something different. Conclusion. They bought the gap close today quite vigorously. 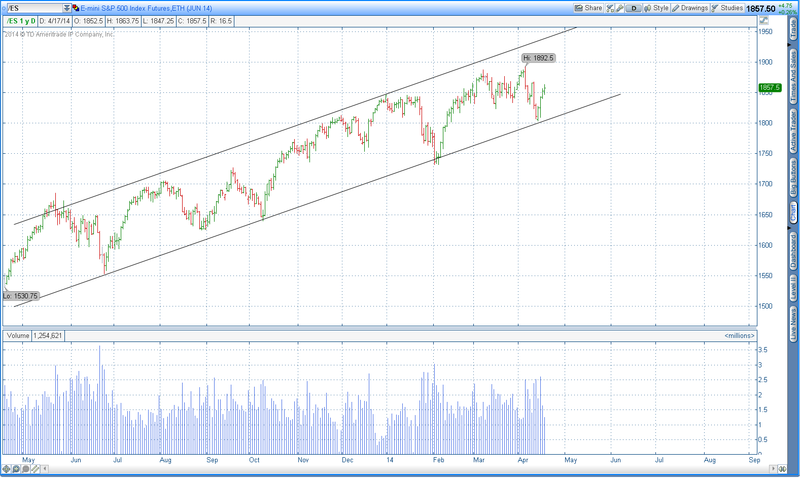 It also happened to be major lower channel support so its not surprising. If lower channel support is smashed through - such as in the bearish [i]-[ii], (i) - (ii) count just above, then yes might have some serious selling coming at us. In the end we have to let the market show us its hand. It has kept it hidden, as it usually does, quite nicely. We have options on the next major counts and we eagerly await. One of the 2 patterns below may likely prove out to be correct. Bear count. If this is correct, prices are heading south in a hard way soon. Short term bull count. If this count is correct then prices will hold and manage a new high, even if marginal. Supporting evidence gives a lot of credence to the bears. Why? the market has been very fragmented and many momentum indicators are flashing a waning long term rally is ending. 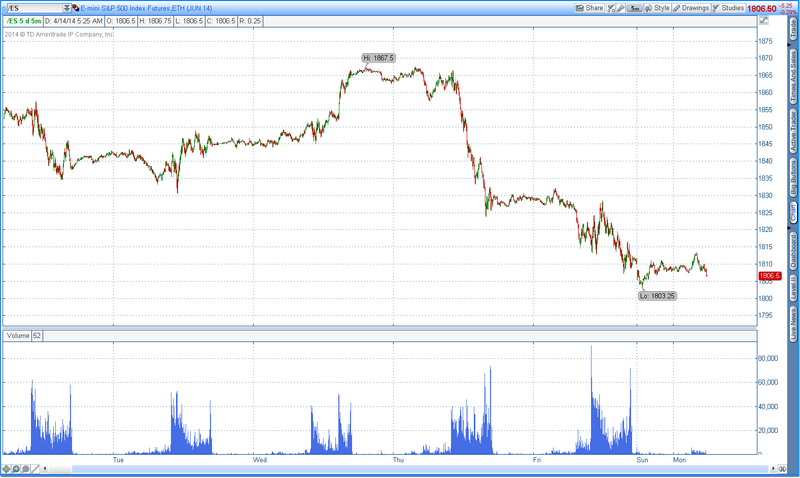 In fact the DJIA closing high was still in 2013! Even if the Wilshire was to manage a new high, the high would be a [v] of 5 high and the market would be due to turn down anyway. 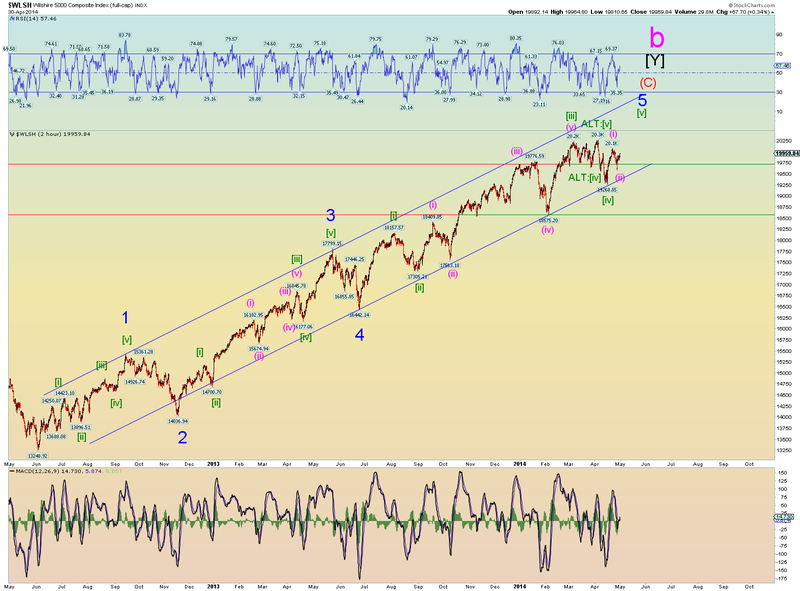 The really scary part is if the bear count is correct, the market is now only getting started on a potentially powerful subwave (iii) down. Thats EW logic in a nutshell. We still have a valid potential expanding wave Minute [iv] triangle but market internals don't seem to be validating that. The market is fragmented and internal selling measures are increasing. In any case things should get exciting. 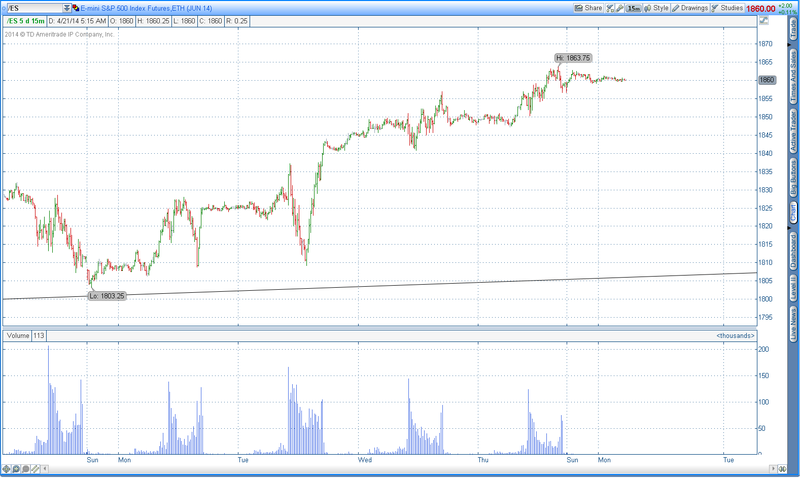 Prices traced out a pretty decent expanding triangle. Expanding triangles can only be a wave four of some kind (if that's what it is) so to make sense of the count, we'll count the triangle as Minute [iv] of 5 and see what happens. 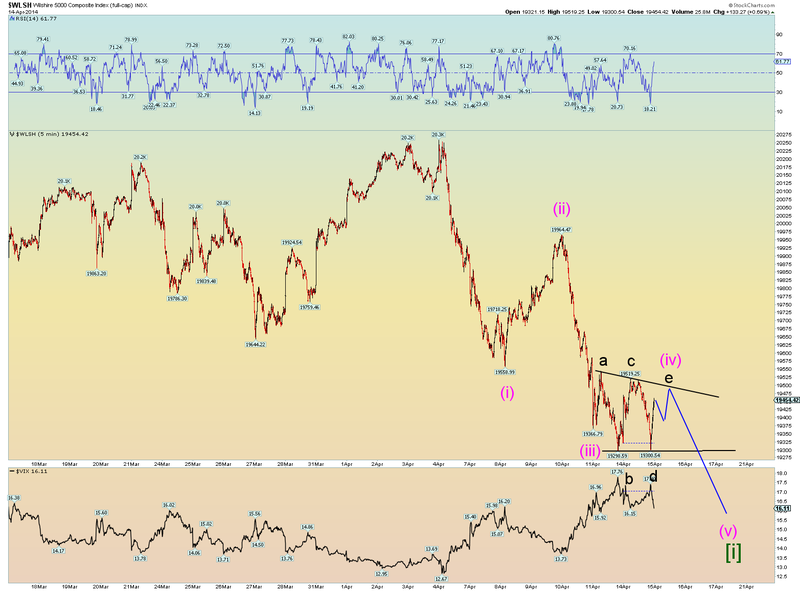 A lower low would nullify the triangle and signal a likely strong bear move. But until a lower low actually occurs, the overall uptrend is still solidly intact and we have a count that works for that. Here is the triangle closer up. Unless the top was actually Minute [v] of 5, we can only post the probable counts and see what happens. 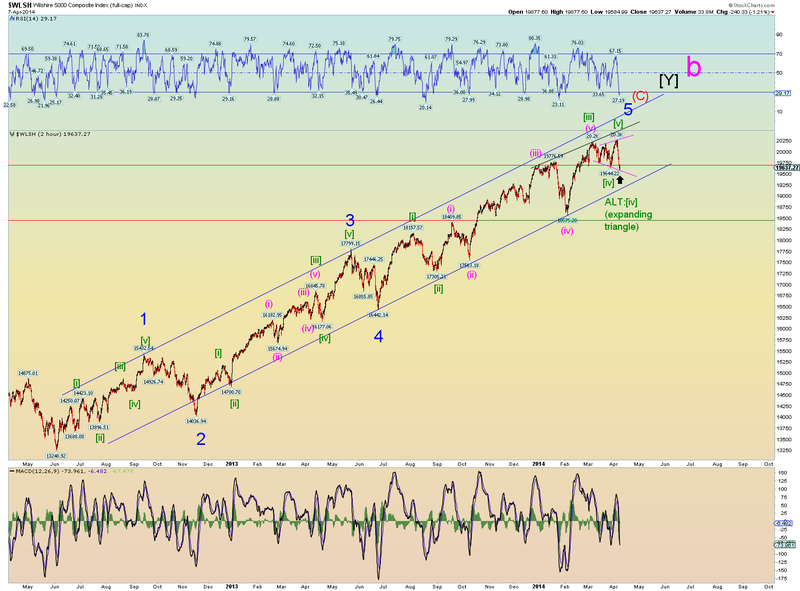 I would love to see a higher market price high coming (in the Wilshire) as that would confirm the triangle count was correct and that would confirm that the triangle is most likely the last corrective in the uptrend (triangles in an uptrend occur as the last wave four in a wave sequence) and that means we can predict the uptrend will exhaust as a result. Thats EW theory in a nutshell. The primary and alternate counts is the best we have right now. The next few days should be very helpful to the overall count. 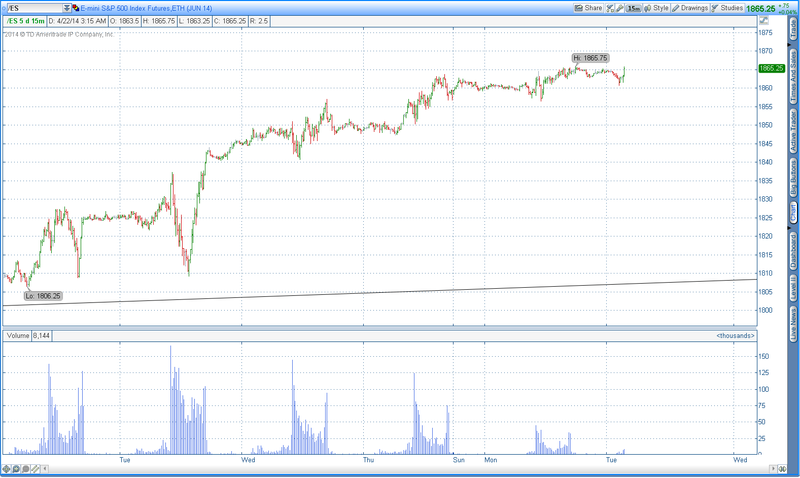 The SPX closed above 1850 so that has neutralized the bears for a day. Last week I mentioned that if the bears could manage a solid close under 1850 SPX, they can seriously injure the bulls. Today that happened. 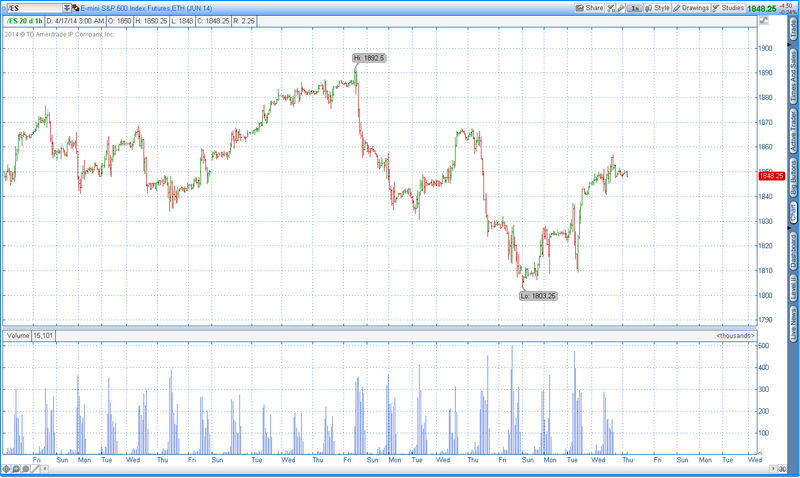 Reorganized the count once again to try and make sense of the recent sideways action of late near the highs. I think it will work. 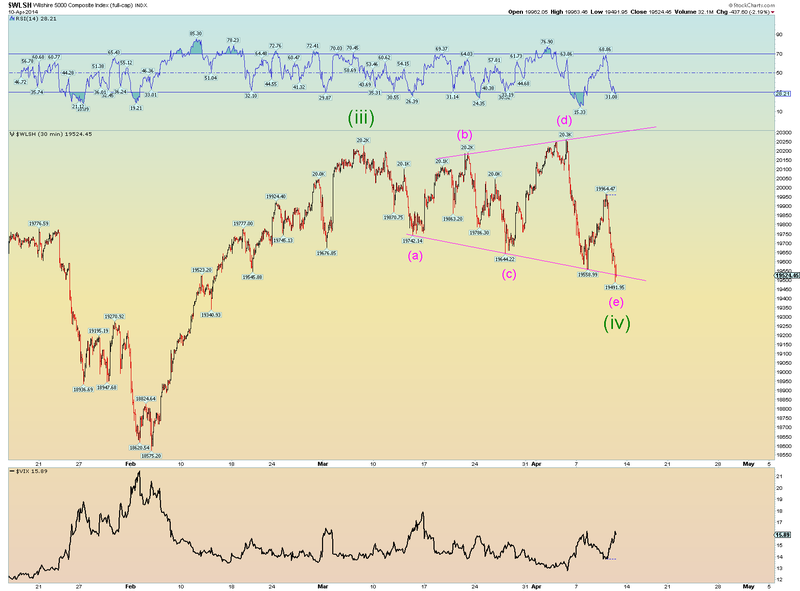 Note the alternate is a Minute [iv] expanding triangle which would imply new highs are coming if that was the case. 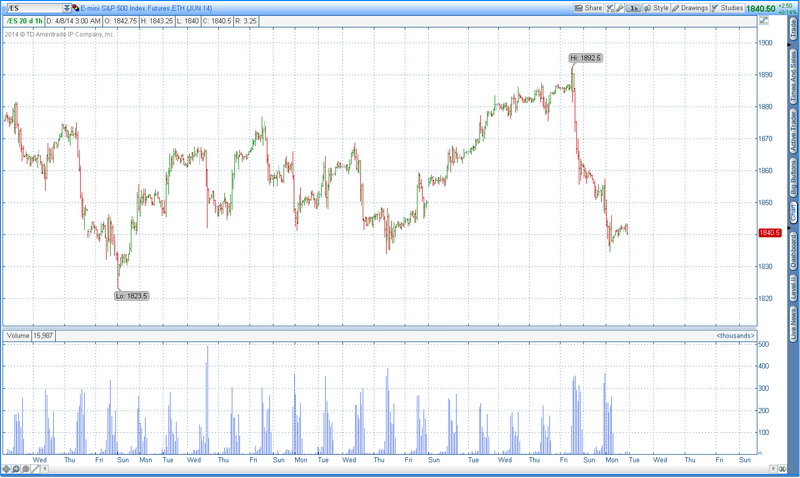 But price action is certainly bearish the past 2 days. 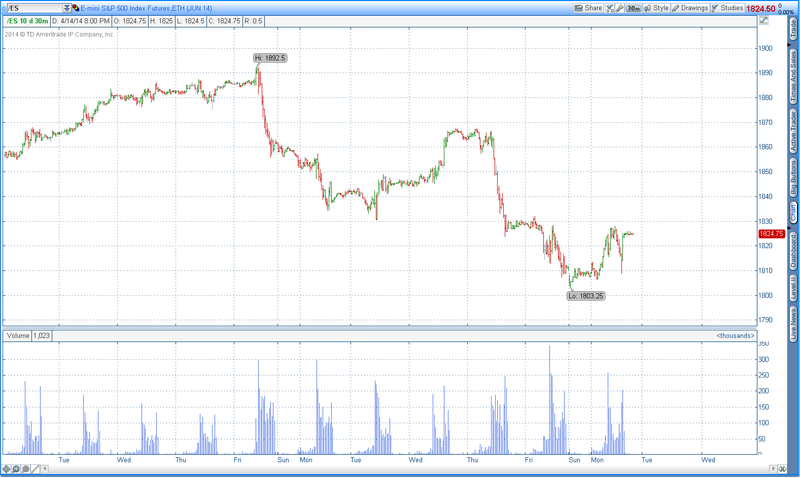 The rest of this week's price action should go a long ways toward solving the larger EW count. We shall see. 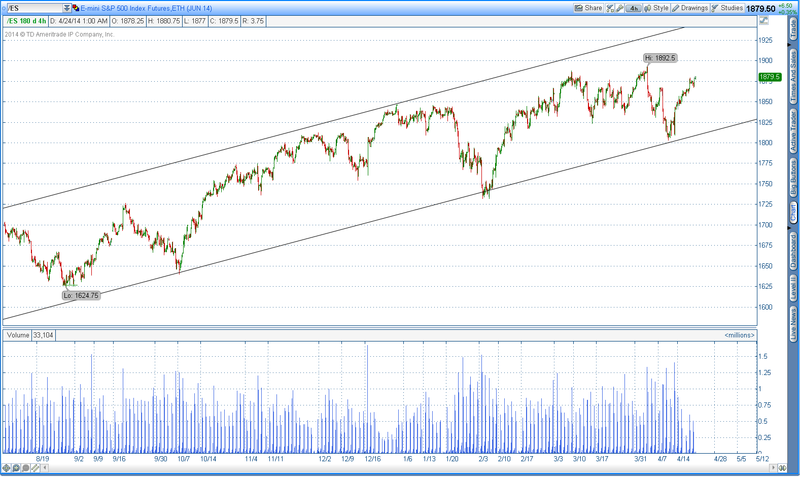 The 2 year channel has to be broken for us to confidently say the uptrend is over. Obviously that has bit more to go before that happens. Weekly shows a lame and diverging RSI as we might expect at a top.